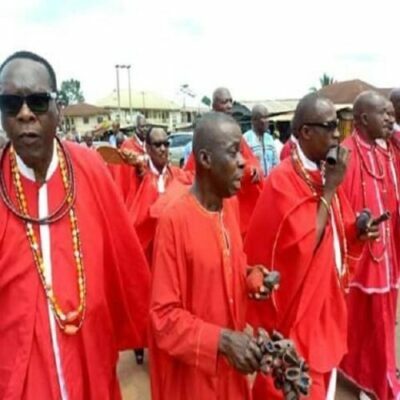 Ekpoma League of traditionalists have placed curses on fake pastors, kidnappers, armed robbers, cultists, human traffickers, traitors and other evil doers in the land. 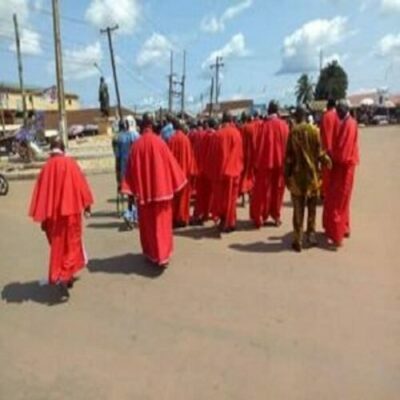 The curses were pronounced by the league of traditionalists(comprising seers, voodooists, charmers, witch doctors, necromancers etc) who led a procession through the streets with charms in hand including amulets, concocted black portions in phial pots/bottles, eggs and some other items to place curses on all evil doers in the land of Ekpoma. (1). That his/her life shall surely be cutoff in like manner he/she did to his/her neighbour(s). (2). That as many a people or individual that practice/indulge in any or all of the above crimes, these curses will destroy them without mercy! (3). That all fake Prophets in Ekpoma whose stratagems are to perpetrate evil, to dupe, or to bring upon the people pains and anguish…these curses will destroy them without mercy! (4). That all liars lying or saying all sort of rubbish or casting aspersions at the Onogie of Ekpoma even on matters he knows nothing about and with the intention to run him down, either through the online social platform, or any form of digital electronic media… these curses will destroy them without mercy! May the ‘gods’ of our ancestors and the Supreme God Almighty who are ‘haters of evil but lover of Truth and Justice’…may they destroy (in absolute damnations) all these evil men/women who do not want peace, progress and development to exist in Ekpoma Kingdom! READ ALSO: Story Of Late CAC Founder, Apostle Ayo Babalola From The Book That Reveals His Life!